This might be the coldest winter we've had in Edinburgh since Judson and I moved here in 2013. It's definitely not the snowiest (last year), but it is cold this year and I don't think the temperature has crested the freezing point in two weeks. It's so bad that last week after catching a late showing of Star Wars at a theatre less than one half mile from our flat, we caught a cab home because it was a straight uphill walk and we didn't want to deal with it in the ice late at night. It's so bad that even when we're just running her out into the garden for a quick outing, we still have to bundle Holtzmann up in her tiny tartan jacket so she doesn't get too cold. All that cold, alas, has not turned into snow. I still love snow with the relish of a child who grew up in Florida, and despite the fact that I get around solely on foot in this city and am not great at negotiating cobblestones disguised by a layer of ice and snow, it's still worth it when the snow falls on the castle and on these adorably cosy streets. Plus, we really want to see Holtzmann to have a chance to play in the snow. Given the refusal of the temperatures to budge, I'm still holding out hope for a white Christmas. In the meantime, if it's not snowing outside, at least it can snow indoors... which is how I ended up with a batch of Lemon Snowflakes and Snow Drop Kisses gracing my kitchen this weekend. The Lemon Snowflakes are great- another toasty, nutty cookie that is supposed to be made with pecans and so another chance for me to use pistachios instead (if you're reading this and trying to think of a Christmas gift for me, SEND PECANS!). They're easy and they're supposed to be messy, which takes the pressure off of you if, say, you've spent the last week making intricately decorated wreaths, stars and gingerbreads. As for the Snow Drop Kisses, these are basically just meringues with fruit mixed in, and the mystifying addition of oatmeal. I'm not very good at making meringues. Probably this is because I had never had one until age 20 when I moved to Paris, but regardless, every time I've tried to make them they've come out tan. Add to this the fact that I'm not really sure what they're supposed to be and you have a recipe for meringues that I enjoy but am too embarrassed to serve to friends. Are they supposed to be crunchy all the way through? Should they have a chewy centre? I don't really know. All I know is that I had a really hard time getting these to be firm on the outside without burning all the fruit in the middle. 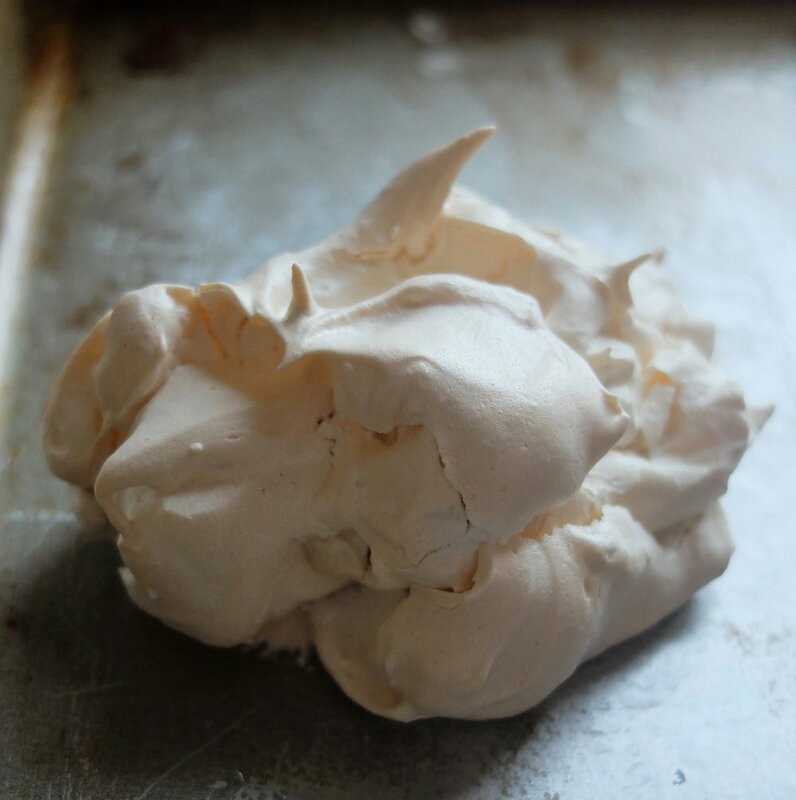 Here's where I landed: 15 minutes at 150C/300F gave me a meringue with a soft, marshmallow-y centre with a dry exterior. The meringues were just this side of ivory, but when I bit into one I was pleasantly surprised to find that the oatmeal had become a crisp counterpoint to what otherwise would have been an overpowering soft/sweet mess. The apricots (my supermarket is sold out of mixed candied fruit since everyone is making last minute puddings this week) worked well and added another dimension of flavour, and overall, although these aren't pretty enough to serve to other people, I actually rather like them. 4 spoons out of five. The frosting really makes these, so don't skimp on it! The heavy amount of cornstarch in the dough gives them a silky crumb, and, paired with a zingy bright frosting to cut through the crunch, they're the perfect addition to any holiday party platter. 3 spoons out of five. I'm really only deducting spoons for the fact that they're not very pretty. If you like your meringues soft and sticky on the inside, make these for yourself asap. Preheat oven to 175C/350F and butter two cookie sheet. Gradually beat in ½ c powdered sugar, then the cornstarch and flour. Chill at least one hour or up to overnight. Spread chopped nuts on waxed or parchment paper. Place a ball on the chopped nuts and press gently and evenly with the bottom of a glass until a thin disk is formed. Place cookies, nut side up on prepared cookie sheet. Bake 12 minutes or until the edges are just beginning to turn light golden. While cookies cool, make the frosting: beat remaining powdered sugar, melted butter and lemon juice until mixture forms a thick paste. Line cookies up in rows and pour frosting over the cookies by moving back and forth in quick motions. Preheat oven to 150C/300F and grease two large cookie sheets. In a very clean bowl, beat egg whites until frothy. Add vinegar and vanilla and beat a few seconds more. Add sugar, one tablespoon at a time, mixing well after each addition. Continue beating until mixture is stiff and glossy and you can no longer feel any grains of sugar in it (this will take at least 10 minutes). Gently fold in fruit and oatmeal with a spatula. Using a teaspoon (for firmer meringues) or a tablespoon (for softer ones), drop onto prepared cookie sheets. Bake 15-18 minutes until the outsides are dry but give slightly when you poke them. Best eaten fresh. May also be served with whipped cream like mini pavlovas.